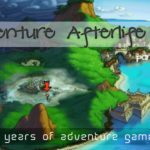 I’m once again helping to run AdventureX, a convention dedicated to narrative and storytelling in gaming. We’ve been running a Kickstarter which has gone pretty well and is allowing my co-organisers Tom and Ali to go out and secure superb speakers and entertainment. The convention is free to attend and will run in London on the 19th-20th November.